The annual Festival of Cranes in central New Mexico's Bosque del Apache Wildlife Refuge isn't just about cranes. The festival brings together experienced birders and those new to the hobby, providing opportunities for learning about the sandhill cranes and other wildlife. The festival also offers workshops and experiences about the refuge. The Bosque del Apache is a refuge for all seasons, but fall and winter are the time to see the greatest number of birds, from early November to mid-February. Each fall, thousands of birds flying south stop by, where they can be viewed, photographed, and witnessed en masse. 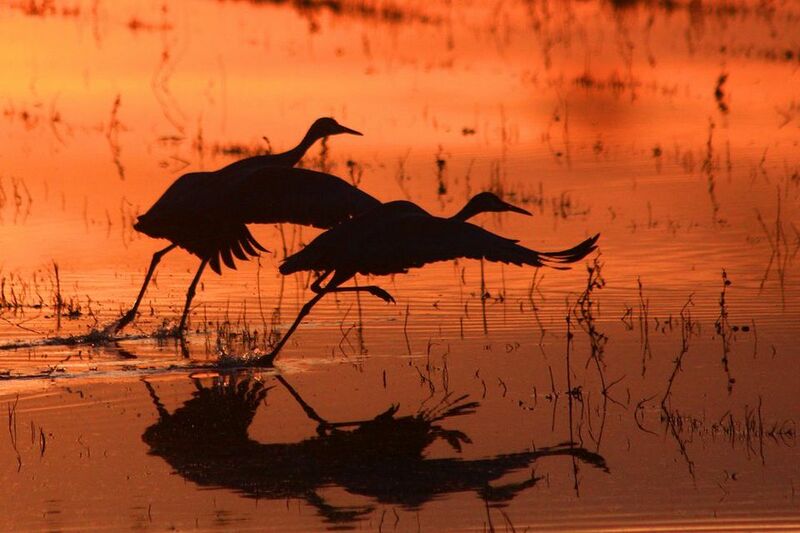 The annual Festival of Cranes takes place each November, with the star attraction being the sandhill cranes. Many visitors arrive before dawn so they can see thousands of light geese milling upon the water. As the sun rises, the flocks rise en masse in a cacophony of sound and wing. Sandhill cranes leave in groups after the geese. The geese and cranes spend the day in nearby fields where they forage. Afternoons, the birds fly back in with waves of sound and wing in a display as spectacular as the morning takeoff. The annual Festival of the Cranes takes place both outdoors and indoors. At the auto loop, visitors can drive around the refuge. Observation decks around the loop make perfect stopping places to take photographs, use viewing scopes and learn from the volunteers stationed there. Indoors, there are over 100 lectures, workshops, and hands-on activities, all related to the annual bird migration. Outdoors, hikes and tours will take place, such as special photography tours. A wildlife zone features exhibits and demonstrations as well as rescued birds. There are opportunities to take horseback rides, ride bicycle trails, learn about the birds, and hear speakers on a variety of topics. A wildlife zone features exhibits and demonstrations as well as rescued birds. There are opportunities to take horseback rides, ride bicycle trails, learn about the birds, and hear speakers on a variety of topics. Over the course of six days, visitors can experience the beauty and wonder of the migrating birds in a variety of ways. The annual event is run by the Friends of the Bosque del Apache, a non-profit organization. The Expo Tent has representatives from camera, optics and eco-travel companies on hand to talk about what they offer. The tent also contains a place to get your coffee. At the festival, learn from members of the Audubon Council, the Central New Mexico Audubon Society, the American Birding Association, and the Friends of the Bosque. Entrance to the vehicle tour loop is south of the Visitor Center. The auto loop tours open from one hour before to one after sunset. The Visitor Center is open from 7:30 a.m. to 4 p.m. on weekdays and 8 a.m. to 4:30 p.m. on Saturdays and Sundays. The cost is $5 for auto loop tour per vehicle. A nearby place to visit on the way to or from the refuge is the Sevilleta Wildlife Refuge. The refuge lies just north and west of the highway on the way to Socorro. Visit the Very Large Array (VLA), an array of radio telescopes, which can be found just west of Socorro on the Plains of San Augustin.